On February 23, ChinaSF celebrated its 8th annual fundraiser alongside the grand opening of Chinatown’s newest culinary destination, China Live. ChinaSF celebrated its success as an economic initiative of San Francisco’s OEWD. With the support of ChinaSF’s network and the opportunity to sample the best Chinese Cuisine has to offer, ChinaSF celebrated with over 800 attendees and fundraised $24,609.09. China Live is a 30,000 square foot development that will house three distinctly different restaurant concepts, bar and a retail section, creating more than 90 jobs to date. On May 17, ChinaSF helped Suman Energy host a reception to talk about this new company and its new products. Dr. Shi, the company’s founder and also founder of the company Suntech, shared his passion for solar energy and introduced his new products like the light weight, flexible, thin solar panels which he hopes to bring to our global economy to compete with Tesla. From June 20 – June 22, BIO hosted its 24th annual BIO International Convention in San Diego with more than 6,000 attendees from 65+ countries. Helen Li represented ChinaSF and collaborated with SFCED to promote San Francisco and its growing biotech hub and opportunities. ChinaSF hosted a successful booth with SFCED, resulting in meeting over 30 Chinese delegates. Through interacting at this event, ChinaSF is in the process of signing a MOU with China’s Chamber of International Commerce. 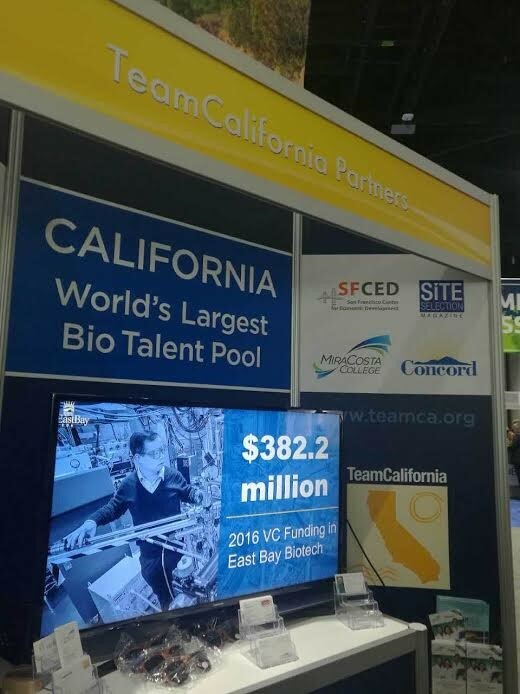 Additionally, Shanghai Bio also expressed its interest in San Francisco Bay Area and collaborating with ChinaSF to set up a San Francisco office. On June 23, ChinaSF hosted our Life Sciences Gateway biotechnology panel event at QB3 in San Francisco’s Mission Bay. Through the attendance of leaders at QB3, JP Morgan, Wells Fargo, Deloitte, Theranova, and Natosha Safo from OEWD, attendees were able to discuss the opportunities in both San Francisco and its growing biotech industry. Representing the new biotech industry in China, 10 Chinese delegates were brought to ChinaSF’s Life Sciences Gateway after attending the BIO International Convention. In successfully educating and collaborating with China’s Chamber of International Commerce, not only did ChinaSF provide the resources and opportunities our biotech hub offers but we also enabled China’s Chamber of International Commerce to establish its biotech footprint in San Francisco. As the highest-profile event dedicated to promoting foreign direct investment in the US, Select USA held its 4th Investment Summit this June in Washington, DC. This year, Select USA had a record attendance of more than 2,800 participants from over 60 international markets and 51 U.S. states and territories. In particular, over 200 Chinese investors were brought by the US Trade Office to enable greater Chinese attendance at this large event. ChinaSF was honored to be the only sponsor from California to join Greater Washington China Investment Center's dinner cruise welcoming the Chinese delegation to Select USA 2017. ChinaSF’s executive director, Darlene Chiu Bryant represented ChinaSF at its 3rd attendance at Select USA and hosted a successful booth, resulting in gaining 72+ contacts at this event. On October 5th-6th, ChinaSF supported InvestSF program in Singapore. Darlene Chiu Bryant represented ChinaSF to speak at the program about business environment in San Francisco. She also shared the insights and discussed with other speakers at the panels about challenges, as well as the opportunities and practical implications involved in entering the US market. On October 9th, a signing ceremony between ChinaSF and Shanghai Lingang Group was held at Caohejing Renaissance Hotel in Shanghai. Under the witness of San Francisco Mayor Edwin Lee, director of Office of Economic and Workforce Department Todd Rufo, director of Planning Department John Rahaim and director of Office of Resilience Capital Planning Brian Strong, Darlene Chiu Bryant signed a partnership agreement with Shanghai Lingang Innovation Center. Both parties expressed full confidence in the in-depth cooperation and the integration of innovative resources in Shanghai and San Francisco. The launch ceremony of 2017 Canton Tower Science & Technology Conference was held in Guangzhou on October 12, 2017. 100 influential speakers delivered impressive speeches. More than 9,000 audience members from home and abroad came to the site, while 7,100,000 people viewed this remarkable event online. ChinaSF was honored to be the only one overseas supporting organization. Todd Rufo represented San Francisco and Helen Li represented ChinaSF at the conference to promote the city. 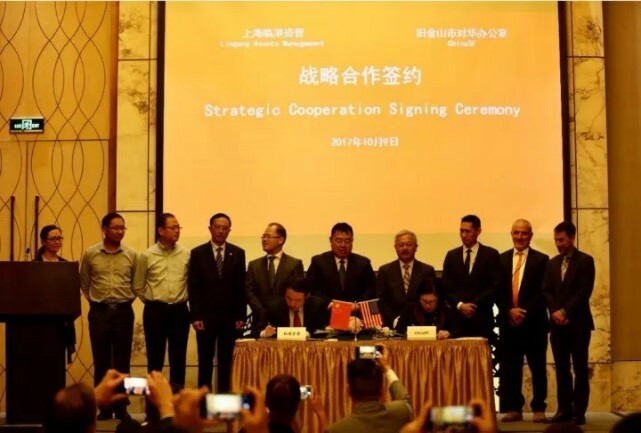 In the evening, Guangzhou Science Technology and Innovation Commission and San Francisco office of Economic and Workforce Development held a signing ceremony to memorize future cooperation in information technology, innovation and entrepreneurship and exchange visits between two cities. On October 13th and 14th, ChinaSF and a delegation led by San Francisco Mayor Edwin Lee paid a visit to Maotai and took part in the launch ceremony for Kweichow Moutai Day commemorative liquor, a specialty product designed exclusively for the American market. During the visit, Darlene Chiu Bryant represented the San Francisco city government and signed a memorandum of understanding on friendly cooperation with Kweichow Moutai Co., Ltd. According to the agreement, the two parties plan to cooperate strategically and extensively and, as part of the cooperation, Moutai will build an office in San Francisco, where a formal celebration honoring Kweichow Moutai Day will be held annually. China Smart City Forum & Expo 2017 is held in China Hi-Tech Fair 2017 at Shenzhen Convention & Exhibition Center, with focuses on leading innovation-driven development, promoting intelligent manufacturing, boosting the transformation of applications in new technology for traditional industries, strengthening the development and application of mobile internet technology. ChinaSF was the only overseas supporting organization. Helen Li represented ChinaSF to speak at Innovative Applications of Smart City session and promote San Francisco.